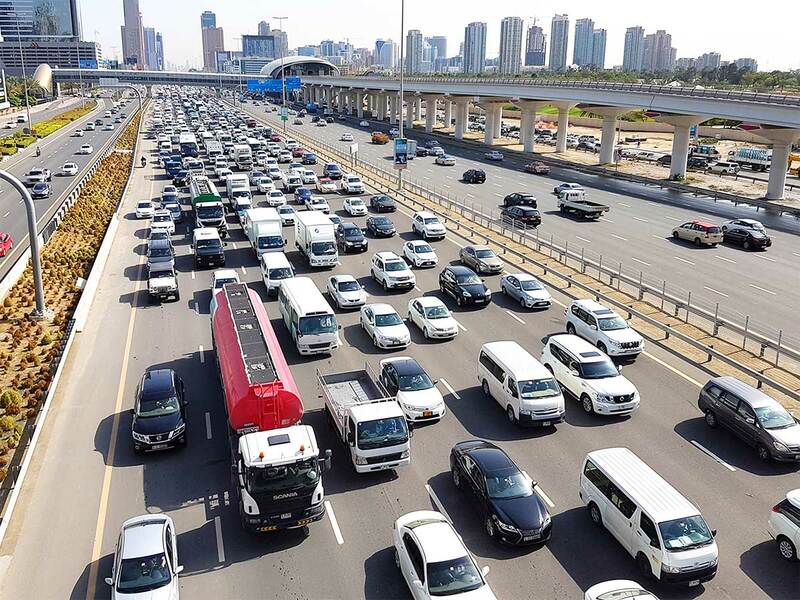 Dubai: Motorists who don’t commit traffic offences for 12 months, starting February 6, could get a 100 per cent discount on their accumulated traffic fines - thanks to a new initiative from Dubai Police. Major Gen Abdullah Khalifa Al Merri, Commander-in-Chief of Dubai Police, said that the new initiative is part of the Year of Tolerance and will help drivers get discounts on their traffic fines, while encouraging them to drive more responsibily in future. “Motorists who don’t commit traffic offences for three months (counted from February 6) will benefit from a 25 per cent discount, while motorists who don’t commit traffic offences for six months (counted from February 6) will enjoy a 50 per cent discount on their accumulated traffic fines,” said Al Merri. Motorists who don’t commit traffic offences for nine months, however, will get a possible 75 per cent discount and motorists who don’t commit a traffic offence for one year will enjoy a 100 per cent discount on their accumulated fines. 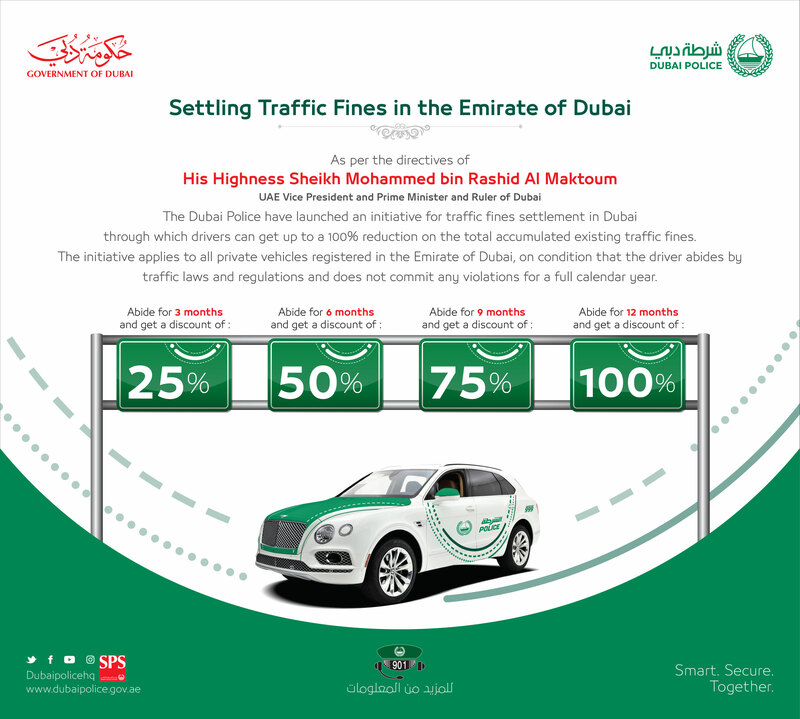 “In line with the Year of Tolerance, we have this initiative for the settlement of traffic fines in Dubai through which drivers can get up to a 100 per cent reduction on their total accumulated existing traffic fines,” said Al Merri. He added that the initiative aims to reduce traffic accidents as drivers will have a stronger motivation to follow traffic rules in order to get a discount on their earlier fines. “The initiative will have a positive feedback and we hope it will make more drivers follow the traffic laws,” said Al Merri. “The initiative will help in securing roads and lives as well as ensuring the happiness of our communities,” he added. He said that the initiative runs until the end of this year, but if it is successful Dubai Police might extend it. 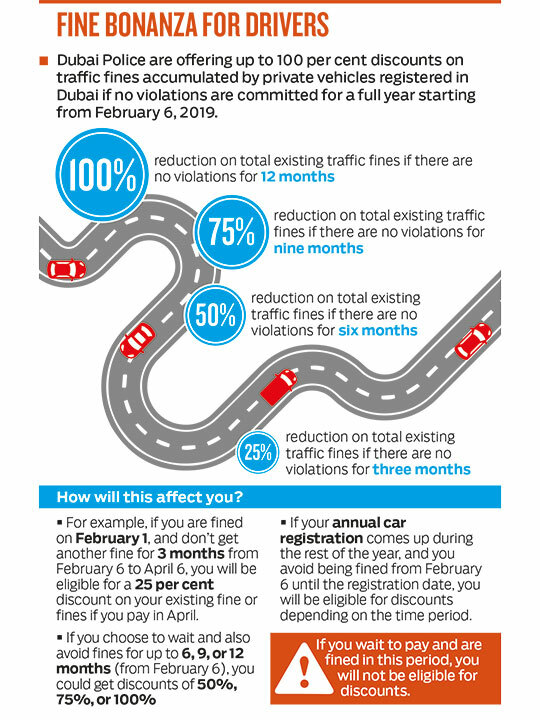 Meanwhile, Major General Mohammad Saif Al Zafein, Assistant Commander-in-chief for Operations, said the 100 per cent discount applies to all vehicles registered in Dubai, on condition that the driver abides by traffic laws and regulations and does not commit any violations for a full calendar year starting from February 6. Parking and Salik fines, however, are not included in the initiative, he said, as they are not traffic offences. Al Zafein added that drivers who reside outside the country for more than three consecutive months from the date of the traffic violation cannot benefit from the initiative. The initiative only applies to individuals who own vehicles and does not apply to vehicles registered to private companies, rental offices and public or private transport companies. “The driver will be computed on February 6 with a 25 per cent reduction for every three months. If a driver commits an offence before the end of the period, he or she cannot benefit from the initiative, and the grace period is recounted from the date of the new violation,” he said. If you got a traffic fine or fines on February 1, and managed to not get another fine for three months from February 6 to April 6, you will be eligible for a 25 per cent discount on your existing fine or fines if you choose to pay in April. If you decide to wait and not pay after three months - and also avoid fines for a longer period such as up to six months or nine months (from February 6), you could get the higher discount of 50 per cent or 75 per cent. However, if you wait to pay and get a fine within the said period, you will not be eligible for any discount on accumulated or existing fines. If your annual car registration happens during the rest of the year, and you have managed to avoid getting any fines from February 6 until the registration date - you will be eligible for discounts depending on the time period.